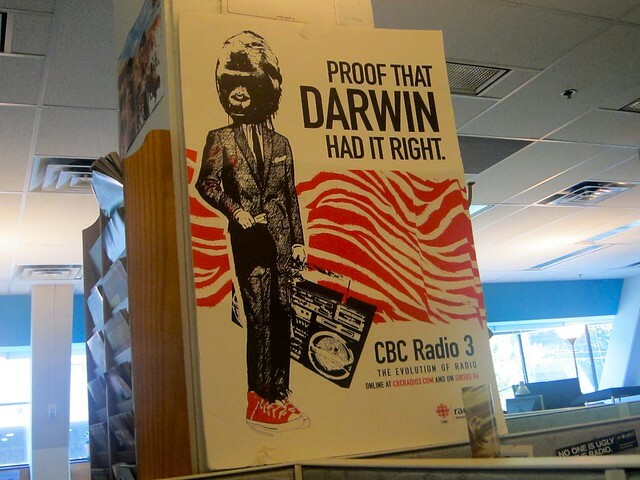 My first week interning at CBC Radio 3 is over and I survived. I had been anticipating this experience for a few months now since winning the Alexis Mazurin Award. It is really a completely different, unique environment. As an online radio station, recently voted Vancouver's favourite, they really do not have a lot of the same concerns terrestrials stations have. Every day, I got to help research and read the top 5 in music segment on the Grant Lawrence Live show. You can listen to me on air after 1:30pm, Monday to Thursday live online. I am still pretty intimidated by the iconic music personality and his professionalism. Unfortunately, I have not gotten to work too much with the other fine hosts. After a few days there this week, Lanarama host Lana Gay is off on vacation in Iceland and France, while Lisa Christensen is upstairs at CBC Radio One. I did get to banter with Lisa on the air on my first day when she filled in for Grant. That was awesome. I love her casual, off the cuff demeanour, and her booming voice. I embarrassingly (and unprofessionally) plugged myself overzealously too hard live, coming off as pretty self aggrandizing within my first few hours there. I was a little too loose and relaxed. So far, the experience has been pretty sweet, especially considering most of my peers are out tracking down news stories. The biggest challenge has been adapting to the personal styles of other people while trying to define myself within that framework. It has been an adjustment but everyone there has been so helpful. I have been producing and compiling the Track of the Day podcast and even got to record my own which will be released a week today. Also, I have been wearing a different concert/music t-shirt every day to great effect. Grant even mentioned my Wolf Parade tee on air. I have been so busy learning the ropes, working on various projects, and just doing everything I can that for the first time in a long time, my blogging, social media, and networking presence has suffered quite a bit.